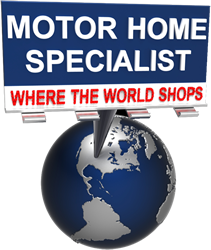 Motor Home Specialist is the #1 Volume Selling Motor Home Dealer in Texas. We offer new American Coach, Coachmen, Cruiser, Dynamax, Entegra Coach, Fleetwood, Forest River, Foretravel, Heartland, Holiday Rambler, Monaco, Prevost, Regency, Sportscoach & Thor Motor Coach. Also a huge selection of quality Used RVs. Fun Town RV is the largest towable RV dealer in Texas! We now have 4 locations across the state to serve you better. We carry Motor Homes, Travel Trailers, Fifth Wheels, Toy Haulers, Destination Trailers, and Tent Campers, made by Forest River RV, Gulf Stream RVs and Palomino RV. For RV Sales in Texas we're open Monday thru Saturday - 9:00am to 6:00pm. New luxury motorhomes and fifth-wheels for sale from Dynamax and Forest River. RV financing. Family owned and operated. New and used campers, fifth-wheels and travel trailers. Outdoor store for camping, hunting and fishing supplies to go with your camper. Used RV sales, 9 bay service center, covered and open vehicle storage. Family-owned RV dealership in Houston. New and Used Travel Trailers, Toy Haulers, Fifth Wheels, and Pop-Up Campers. On site and mobile RV service. Fifth-wheels, motorhomes, travel trailers and campers by American Coach, Coachmen, Fleetwood, Forest River, Heartland, Keystone, Newmar, Skyline and Tiffin. Full service RV repair and body shop. New recreational vehicles by Crossroads ( Cruiser, Sunset Trail ) and KZ-RV ( Sportsmen, Spress ). Parts and service by RVIA/RDVA certified technicians. Used RV sales, rentals, parts and service. Family owned dealership offering sales and service for new RV's by Nu-Wa, Heartland and Frontier RV. 500 N. John Redditt Dr.
New and used motor homes, fifth wheels, travel trailers, and pop up campers from trusted names like Airstream, Dutchmen, and Pleasureway. RV sales and service for more than 30 years. Authorized dealer for Gulf Stream, Forest River, North American Traveler, Palomino and Skyline. RV rentals, parts and accessories. 30 bay sevice department. Complete body and paint. Large inventory, located off of the Interstate in Central Texas. RV sales and repairs. Full service body shop. Sales and service for towable RV's by Rage'N, Frontier, Flagstaff, Cruiser, Doubletree, Sunnybrook and Hampton Park. Located in the Coastal Bend area since 1965. 1122 S Padre Island Dr. Mobile repair service, storage, expert witness and insurance estimates. Luxury motorhomes and prevost bus conversions. Parts and service center. RV sales and service for Airstream, Flagstaff, Montana, Blue Ridge, Freedom Express, NuWa, Columbus, Hampton, Pleasure-Way, Cruiser, Holiday Rambler, Puma, Ever Green, Laredo, Seville, Aviator, Sabre, Road Warrior, Stealth and XLR vehicles, parts and services. Two locations offering new and used inventory, RV rentals, service and repairs. New and used sales, online parts and service for Southeast Texas. 2450 St. Hwy 71 W.
RV sales and service, large camping, parts and accessories store. Sales and service for new and used recreational vehicles. Featuring pop-up campers, travel trailers, fifth wheels and motorhomes, by Forest River, KZ, Palomino, Skyline, Starcraft and Trail-Lite. Sales and service for RV's manufactured by Forest River, Weekend Warrior, Palomino, Cardinal, Heartland, Keystone, and Coachmen. Guaranteed low prices, will match or beat any deal on the same model RV with like options and freight. RV repairs, parts, paint and body work by experienced technicians. Custom coach conversions. RV Sales, Service, Parts, Consignments and Mobile Service. Used RV sales and consingments. Late model motorhomes and towables. Almost 22 acres of motorhomes, travel trailers, and folding campers from Jayco, Forrest River, Fleetwood, Winnebago. Full service parts and warranty repair. New and used RV sales, service and repair. Authorized sales for Airstream, American Coach, Coachmen, Fleetwood, Forest River, Georgie Boy, Itasca, Monaco, National RV, Palomino, Skyline, and Tiffin. Good Sam certified dealer offering a 100% guarantee on select pre-owned motorhomes. Complete repair and chassis service center. Authorized dealer for recreational vehicles by Airtstream, Carriage, Coachmen, Cross Roads, Dutchmen, Forest River, Heartland, Keystone, Open Range and Redwood RV. Consignment sales, parts and service. RV sales and service center featuring travel trailers and fifth wheels by Fleetwood and Keystone. New and pre-owned travel trailers, horse trailers and 5th-wheels for sale with an experienced parts and service department. Trade-ins are welcome and flexible financing options make purchasing your RV or Trailer hassle free. Winnebago, Tiffin and Roadtrek motorhomes, Keystone, Forest River and Shasta travel trailers and fifth wheels, Roadmaster sport utility trailers, and Coachmen Clipper folding tent trailers. #1 Volume RV dealer in the Houston area since 2003. Quality new and used campers, travel trailers, 5th wheel trailers and motorhomes by American Coach, Fleetwood, Heartland, Jayco, Keystone, Newmar, and Winnebago. Full service repair and body shop parts and accessories. Ability equipped motorhomes. New fifth-wheels and travel trailers by Skyline. Large selection of used and consignment recreational vehicles. New and used RV sales and service. RV storage and lot rentals. Towables by Forest River. RV sales rentals for over 54 years featuring new motorhomes, travel trailers and fifth wheels by Jayco, Forest River, Frontier RV and Keystone. 15 service bays, parts and accessories located on the corner of I-10 and FM 1442, Exit 869. New travel trailers by Forest River and Trail Creek RV. RV consignments, parts and accessories since 1985. Horse and livestock trailers by Elite Traliers, Exiss, Featherlite, Gooseneck S&H, Sooner and Sundowner. Authorized Layton Skyline dealer. New and used 5th-wheels, travel trailers and campers. Parts and service. Serving happy campers in central Texas since 1967. Specializing in travel trailers, popup campers and 5th wheels by 2007 Cruiser RV, Dutchmen, Forest River, Skyline and SunnyBrook. RV Consignments. With volume sales comes low prices and easy financing. McClains RV has six locations, four in Texas providing sales and service for luxury motorhomes and RV's by Dutchmen, Gulfstream, K-Z, Itasca, Fleetwood Winnebago, Damon, Tiffin and Sun Valley. Pre-owned and consignment RV sales. Modern service center with factory trained technicians. RV consignment sales, large parts and service department. Features a full line of custom built and production livestock trailers, utility trailers and flatbeds. Brands include R-Pace, Featherlite, Forest River, Xpress, CargoMate and Renegade. Sales and warranty service for campers, fifth-wheels, travel tralers and motorhomes by Carriage, Entegra Coach, Heartland, Jayco, Keystone RV, KZ-RV, Open Range and Starcraft. RV service and body shop. Route 66 RV dealer. Truck Campers and light weight travel trailers by Aliner, Artic-Fox, Chalet, Northstar, Sun-lite, R-Vision, Retro-lite and T@B. RV service for all makes and models by certified, factory trained technicians. Family owned dealership featuring motorhomes by Georgie Boy Gulfstream, Newmar, R-Vision, and Crossroads. Five locations offering recreational vehicles by Coachmen, Forest River, Heartland, Keystone RV, Palomino, and Skyline. Marine products by NauticStar, Blue Wave, BayMaster, Pursuit, Pro-Line, Hurricane, Godfrey, Yamaha, Suzuki and McClain. Specializing in Winnebago motorhomes including the Tour, Journey and Journey Express, Vista, Sightseer and Adventurer. Large selection of Class A, Class C, Class B motorhomes, fifth-wheels and travel trailers. Complete parts and service department. Good selection of towable RV's by Cruiser RV, EverGreen, Forest River and Heartland. RV consignments. RV service and collision repair. 17 acres of new RV's by Sierra, StarCraft, Wildcat, Palomino. Hoosier horst trailers. RV rentals, 20 bay service center. RV rentals, sales and parts west of Houston on the Katy Freeway (I-10) since 1977. Three locations in North Texas offering a large selection of campers by Aliner, Coachmen, Crossroads, Forest River, Jayco and Palomino. RV service by factory trained technicians, parts and accessories store. New RV's by Forest River (r-pod, Sierra, Surveyor, Work & Play), Heartland (Bighorn, Cyclone, Sundance), Open Range and Palomino (Puma). RV rentals, parts and service. Used recreational vehicles, full service repair center with body and paint shop. RV parts and accessories. New and used travel trailers, fifth wheels, pop-up campers and toy haulers. RV Storage and repair service. New RVs by Gulf Stream, K-Z RV, Forest River and Open Range. RV Rentals. Design, conversion and restoration of buses and motorhomes. Large selection of used and consigned RV's. Free RV school, sales and service in the Rio Grand Valley for over 25 year. Houston RV sales and service for CrossRoads, Dutchmen and Skyline. Easy access service center for large motorhomes and towables. Authorized dealer for Coachmen, Gulf Stream and Roadtrek. Used RV's, RV Rentals. Family owned and operated for over 35 years. Air-conditioned showroom, 12,000 square foot parts and accessory department, and a 20-bay service facility. Exclusive North Texas source for RV Warranty Forever. Authorized sales and service for Airstream Touring Coaches and Travel Trailers, Tiffin Motorhomes, Jayco, Cruiser RV and CrossRoads RV. Vogt RV has been serving the Dallas, Fort Worth area for over 40 years. New fifth-wheels, travel trailers and toy haulers by Forest River and Palomino. Parts and service. Large selection of pre-owned recreational vehicles. Trade-ins welcome, we pay cash for used RV's! Campground located behind dealership with 30 and 50 amp sites. Family owned and operated with over 30 years of experience. Truck campers, travel trailers and popup campers by Coachmen, Lance, Palomino, Starcraft RV, parts and service. No. 1 popup camper dealer in Texas. New fifth-wheels, travel trailes, toy haulers and park model RV's by Forest River, Jayco, Keystone and Prime Time RV. Consignments, trade-ins wanted. The RV dealers listed below are for reference. Volume dealer specializing in NUWA- Hitchhiker fifth wheels and Jazz by Thor. Sales, parts and service for towable recreation vehicles. New and used fifth-wheels, travel trailers and motorhomes. RV and marine supplies, RV transport and storage. U-Haul rentals. Sales, service and parts for Newmar, Doubletree, Skyline and Sunnybrook Travel trailers, cargo haulers, and fifth wheels. ATVs and utility vehicles by Arctic Cat. We offer a service and parts department and also do all warranty work on the products that we sell. RV sales, parts and service for Fleetwood, Phaeton diesel by Allegro, fifth wheels and travel trailers by Mobile Scout, Sportsmen, NuWa and Keystone. Select Choice RV Center is a full service RV Dealer offering after sales service, RV consignment sales and rentals. Located on I-35 in Sanger, they offer a wide selection of late model motorhomes, travel trailers, fifth-wheels, toy-haulers and campers. Flexible finance and extended care contracts make selling your RV by consignment fast and efficient. RV and boat sales serivce and parts. Dealer for Lance, Coachmen, Excel, Pilgrim, and Palomino. Sales, parts, service and repair. RV sales and rentals. Two showrooms are easily accessible from I-35, just a short trip from Dallas, Austin, San Antonio and Houston. RV consignment, parts and service. New and used RV sales, large parts and accessories department. Warranty repairs. Used and consignment campers and motorhomes. RV service, collision repair.